Shawn Hutcheon: Scouts listed to attend last night’s Bruins-Flyers game: Chicago Blackhawks (2), Winnipeg Jets (2), Edmonton Oilers (2 – Craig MacTavish) Anaheim Ducks (Dave Nonis), Colorado Avalanche, Columbus Blue Jackets, Detroit Red Wings, Florida Panthers, Los Angeles Kings, Nashville Predators, New Jersey Devils, New York Islanders, New York Rangers, Ottawa Senators, St. Louis Blues, and the Toronto Maple Leafs. Sean Shapiro: Teams listed to attend last night’s Grand Rapids-Texas AHL game last night: New Jersey Devils (2), Toronto Maple Leafs, Minnesota Wild, Pittsburgh Penguins, Tampa Bay Lightning, Winnipeg Jets, New York Islanders, Montreal Canadiens, Vegas Golden Knights, Vancouver Canucks, Philadelphia Flyers, San Jose Sharks, Detroit Red Wings, Boston Bruins, and the Ottawa Senators. 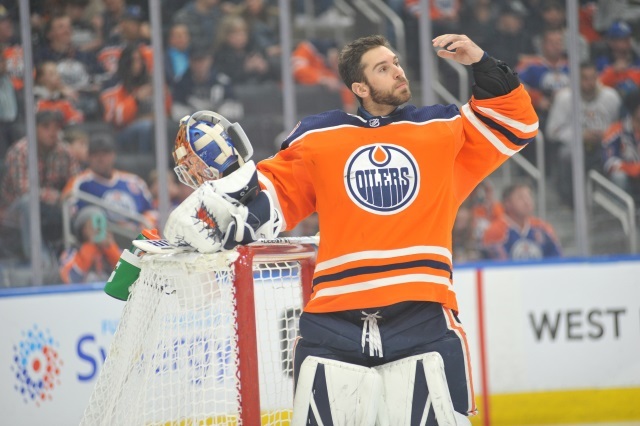 Frank Seravlli: The Edmonton Oilers have been talking with pending free agent goaltender Cam Talbot. They aren’t closing the door on signing him to a contract extension. The Oilers may have some salary cap issues when they need to activate Andrej Sekeras from the LTIR and Talbot would be one option for them to clear some space this year. Joe Smith: Tampa Bay Lightning assistant GM Derek Lalonde after the Toronto Maple Leafs acquired defenseman Jake Muzzin: “My phone was buzzing yesterday. I’m like, ‘Oh, it’s on. It’s on now.” Several veteran players said that they are confident on the team if they don’t make a move, but added that it’s nice for them to be in a position where they could add.